Happy hump day everyone! The new Color Throwdown challenge is up and running and I just LOVE these colors chosen by Lynn: yellow, green, aqua and white! 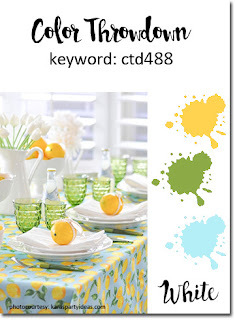 Isn't this table setting a gorgeous inspiration? It just screams spring! 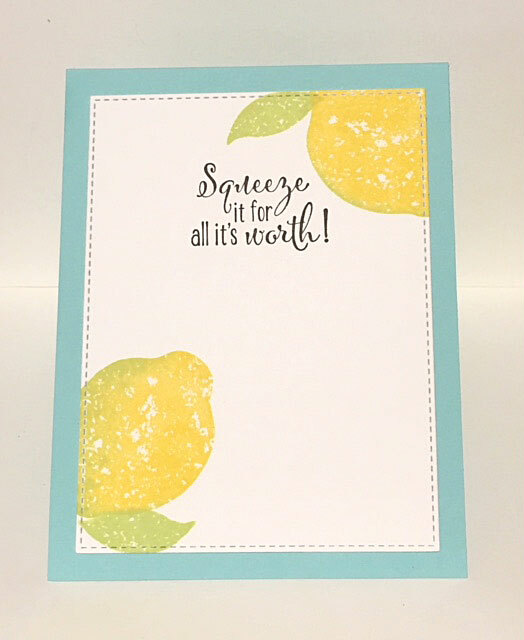 The lemons led me immediately to SU's Lemon Zest stamp set! 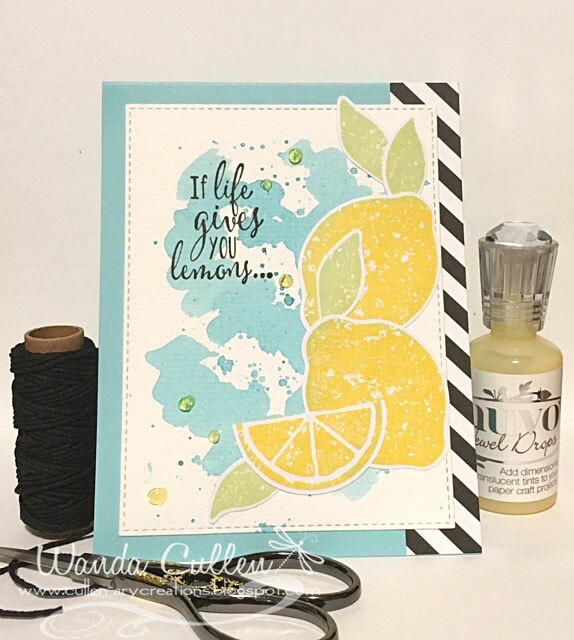 I inked the lemons with Bumblebee ink then "kissed" the edges with Pistachio ink - dye inks by Reverse Confetti. acrylic block then spraying with water, I picked up some ink with a brush and splattered it over the white panel of watercolor cardstock. I then painted some random squiggle markings to create this fun background. Some pale yellow Nuvo Jewel Drops were the finishing touch! PAPER: Iced Aqua (Reverse Confetti), Black and White Basics 6x6 pad by MFT. INK: Bumblebee, Pistachio (RC), Versafine Onyx Black, Peacock Feathers distress ink (Ranger). 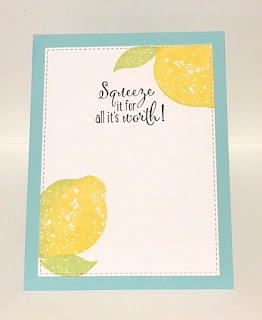 MISC: Lemoncello Nuvo Jewel Drops, Lemon Zest punch (SU), Stitched Rectangle STAX Die-Namics by MFT. APR 11 - "It's not whether you get knocked down,it's whether you get back up." Fabulous use of the colors! Oh I love these stamps!! Your card is so pretty and spring like!! GREAT take on the challenge!